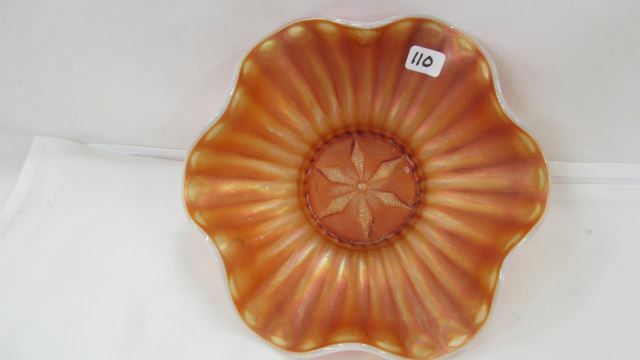 A rather plain design with the title element of a six-petal flower in the center and smooth rays radiating out. 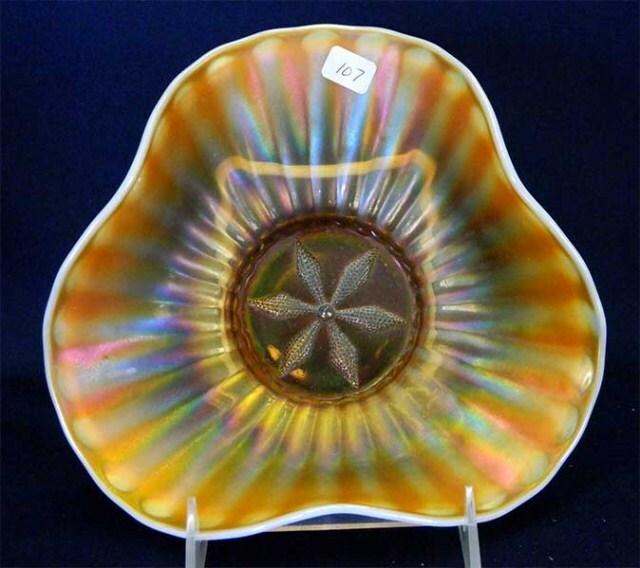 I've only seen these 8-inch bowls in peach opal, though Larry Keig reports purple (see below). 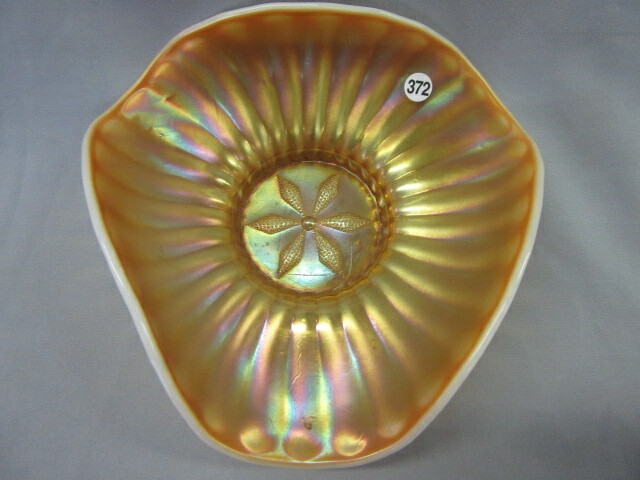 They are usually ruffled like this example but tricorner pieces are known. 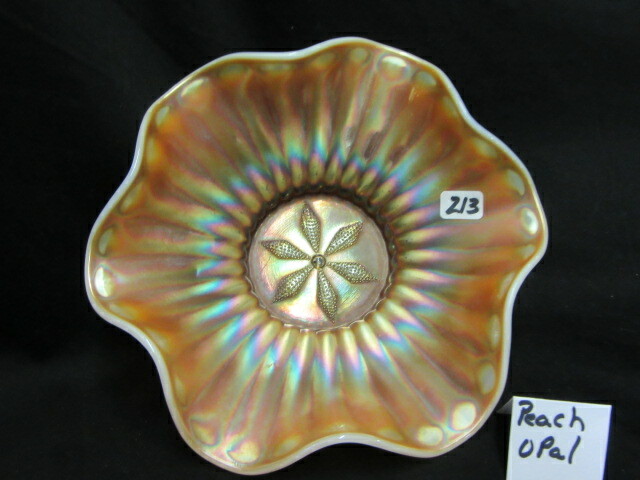 Peach opal sell in the $10 to $15 range. 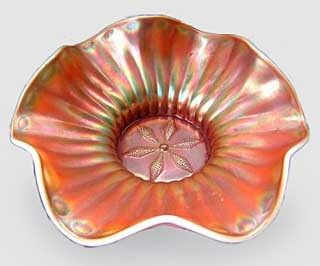 Stippled Flower is known to me only in relatively small (seven- to eight-inch) bowls in peach opalescent and purple. 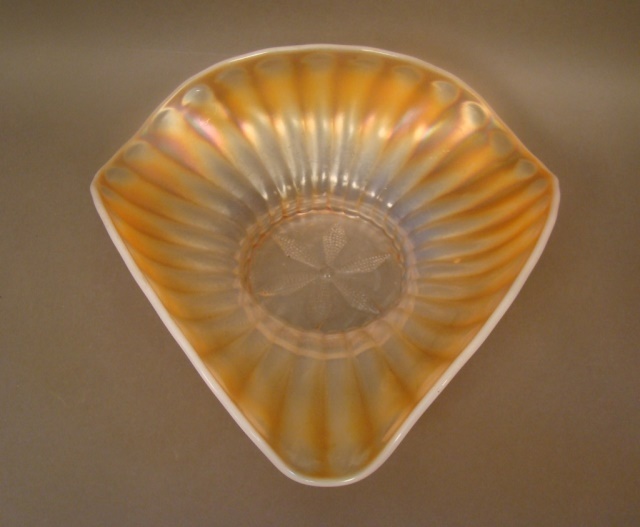 Most of these bowls are broadly ruffled, but some are tri-cornered or square. 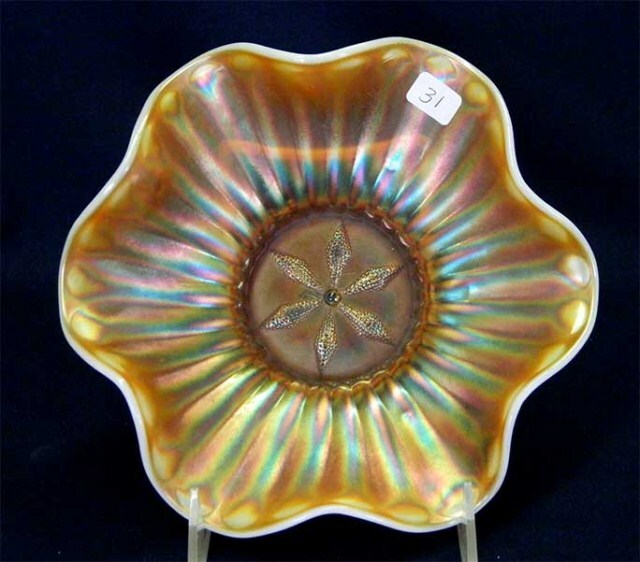 The ruffled peach opal bowls are plentiful; the tri-cornered are a little more difficult to find and the square are a real challenge to acquire. 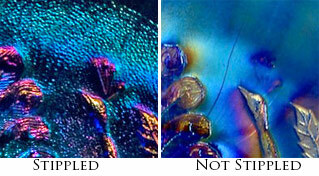 The purple are actually very rare; all of those reported to date are ruffled. 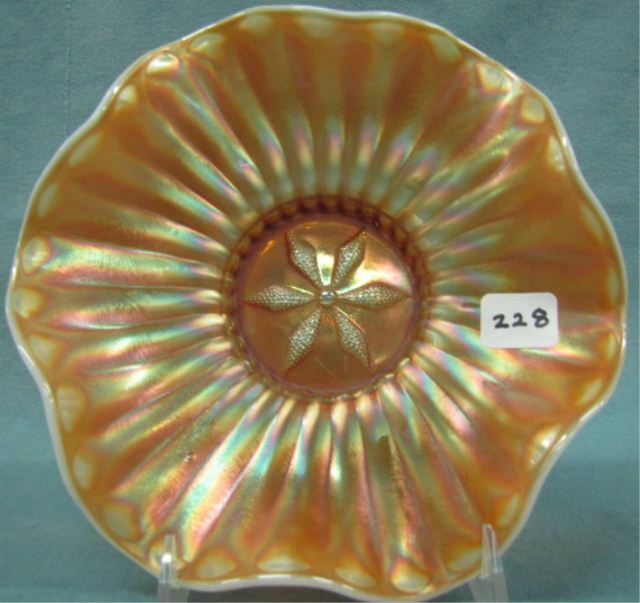 There are, from my observations over many years, literally hundreds of peach opal pieces in this pattern for every purple one. 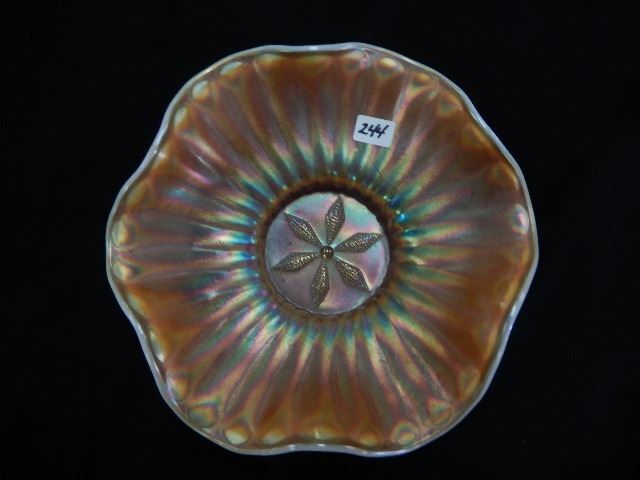 Some of the peach opal bowls come in what was marketed as “Parisian Art,” a process introduced around 1910 by Dugan. 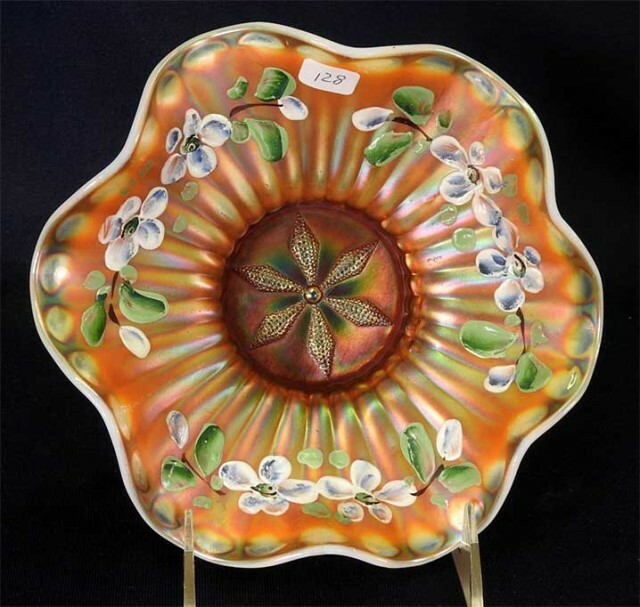 This “Parisian” treatment is what collectors today call “enameled” or “decorated,” with flowers and leaves enameled on the pieces by factory craftspeople who used either their fingers or brushes to apply the paint. 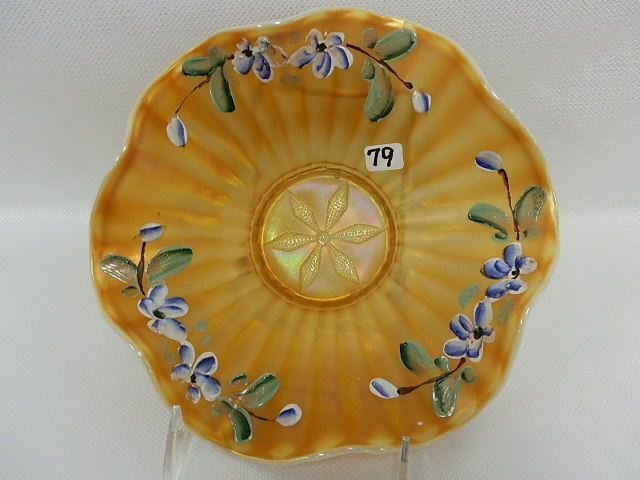 At least two floral and leaf designs are known: Lily of the Valley and Violet. 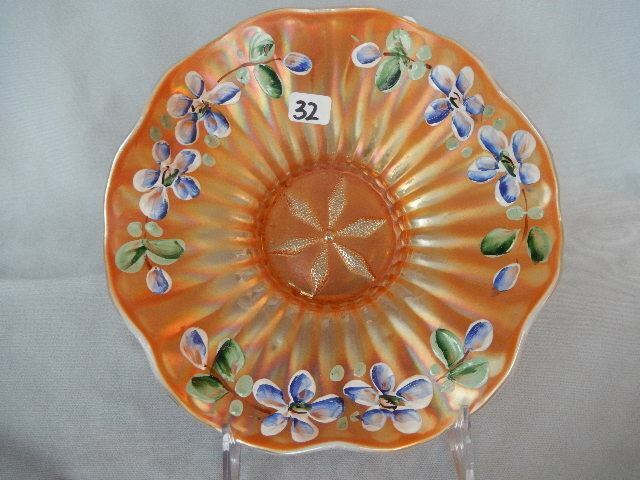 (The leaves on the Violet are stylized rather than realistic.) 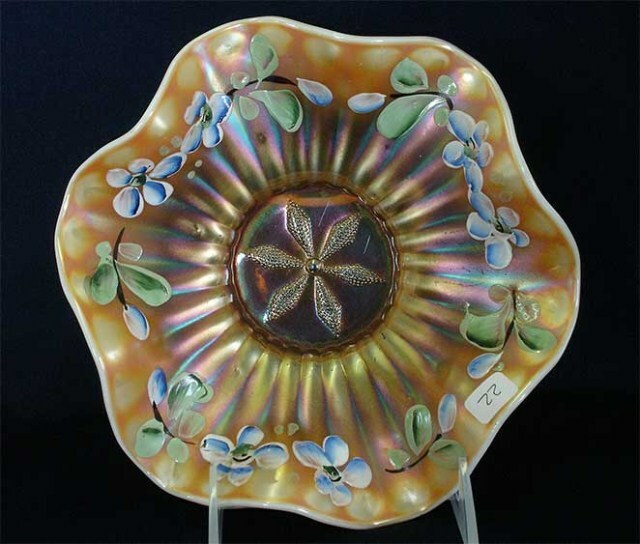 The Lily of the Valley examples appear to be more available than the Violet. 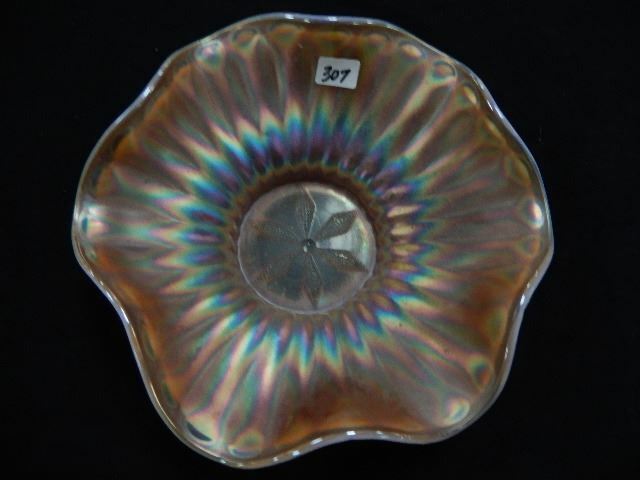 The table below summarizes the colors and decorations known in the pattern. 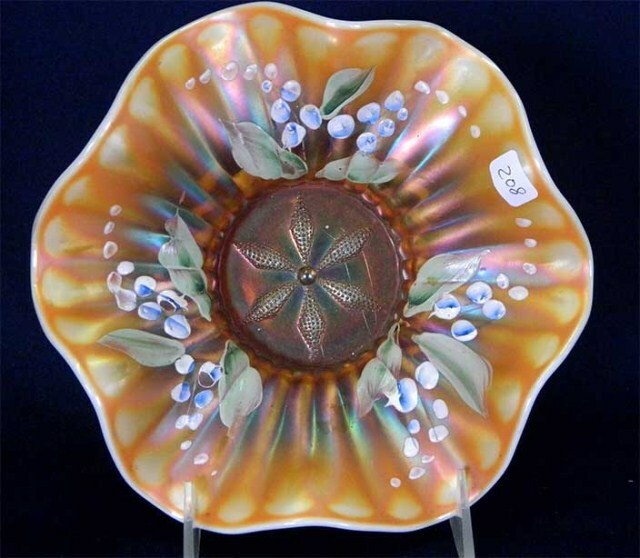 In 2012, a ruffled purple example sold for $250. 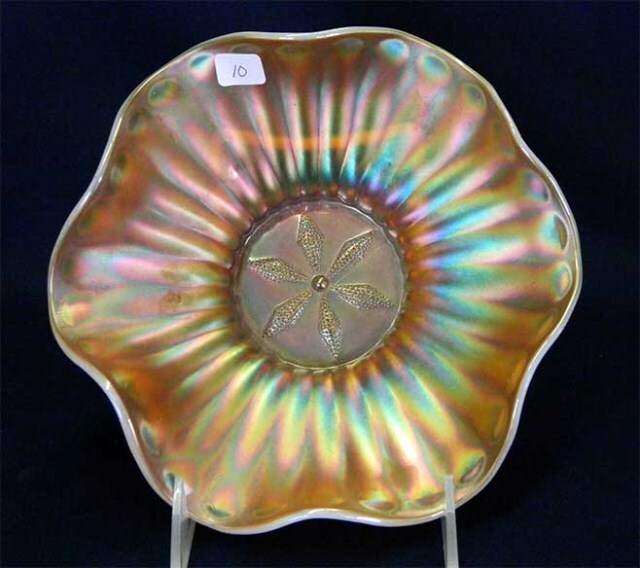 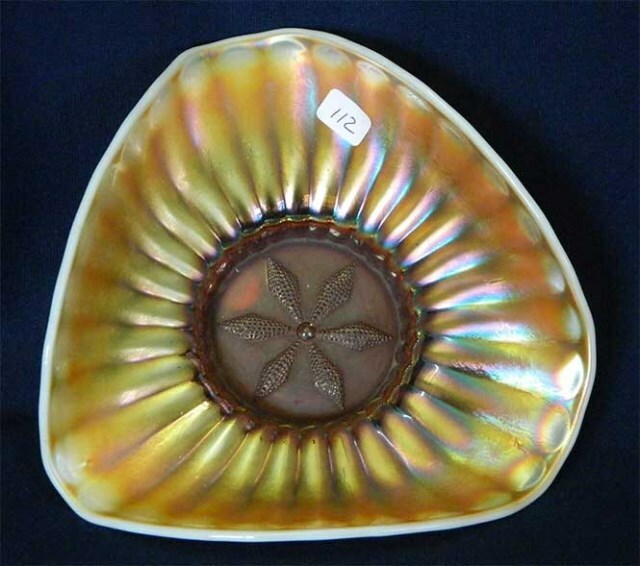 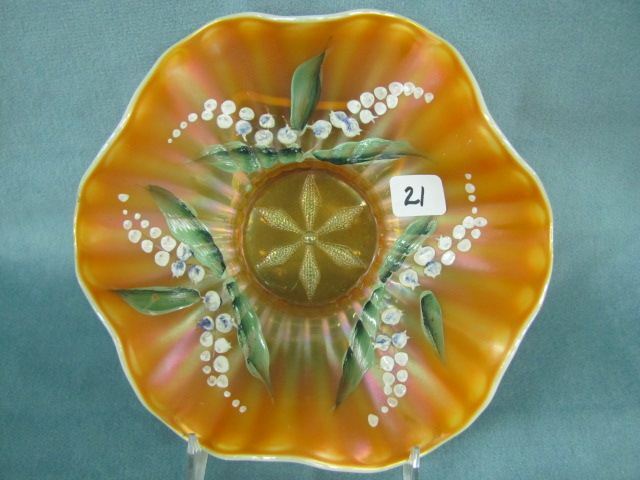 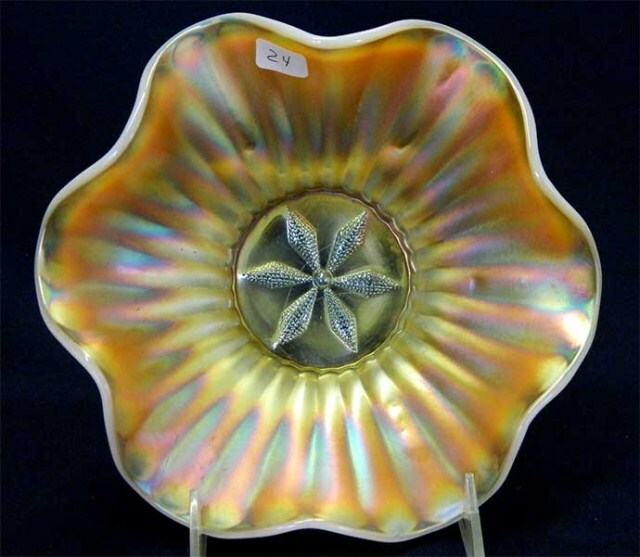 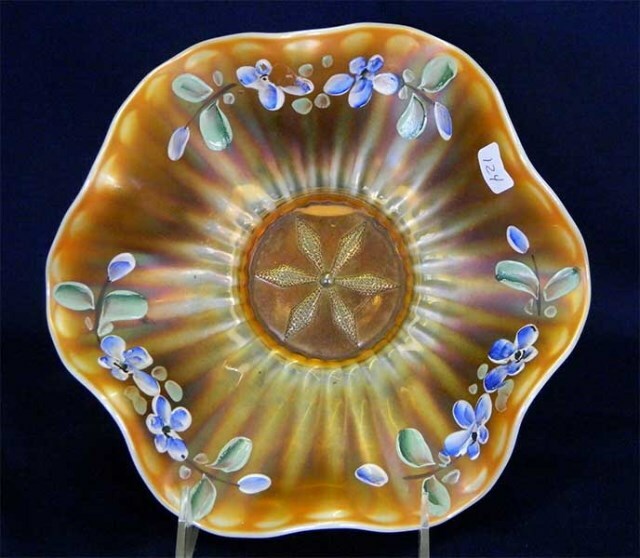 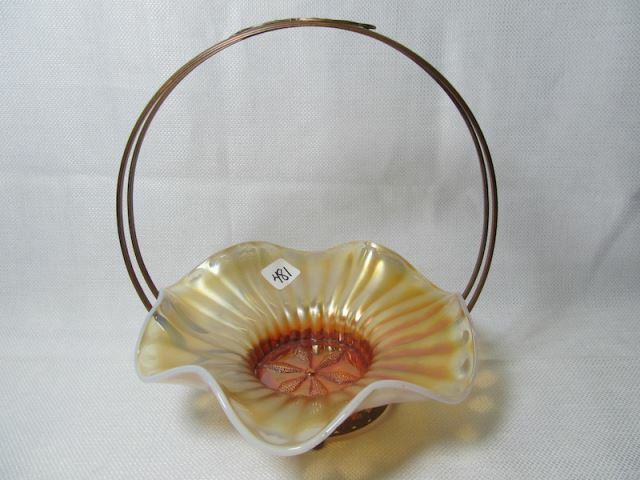 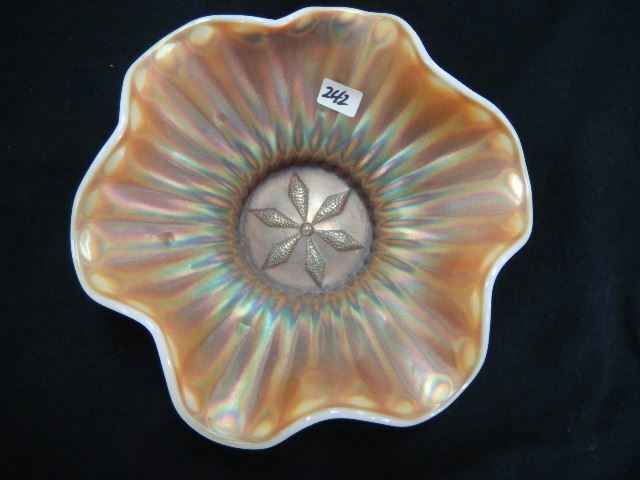 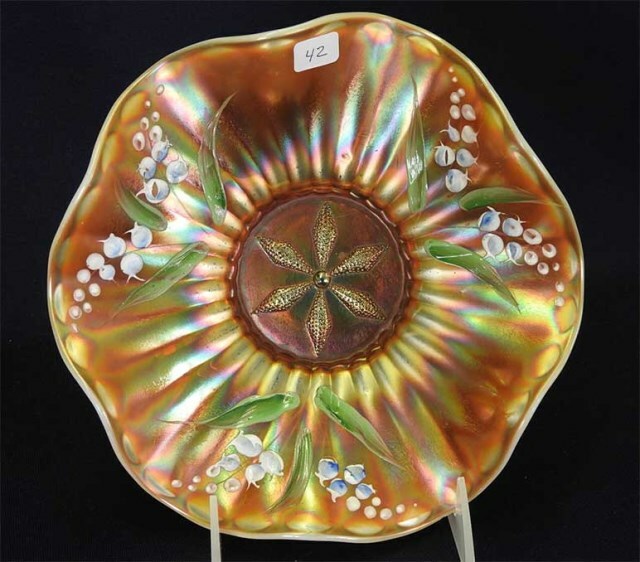 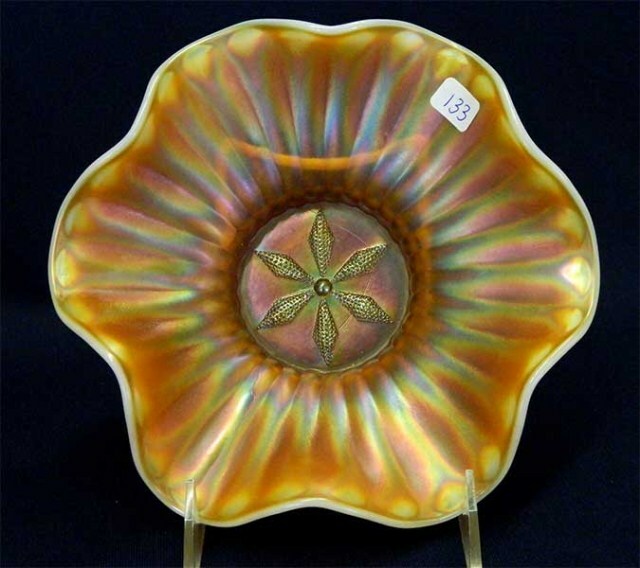 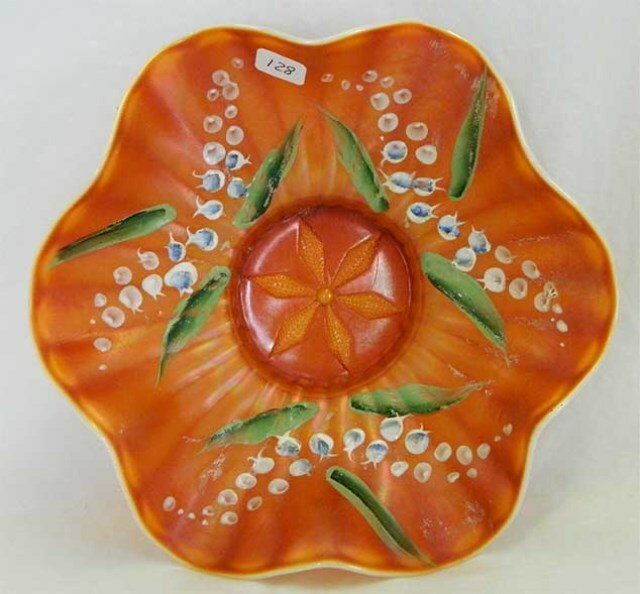 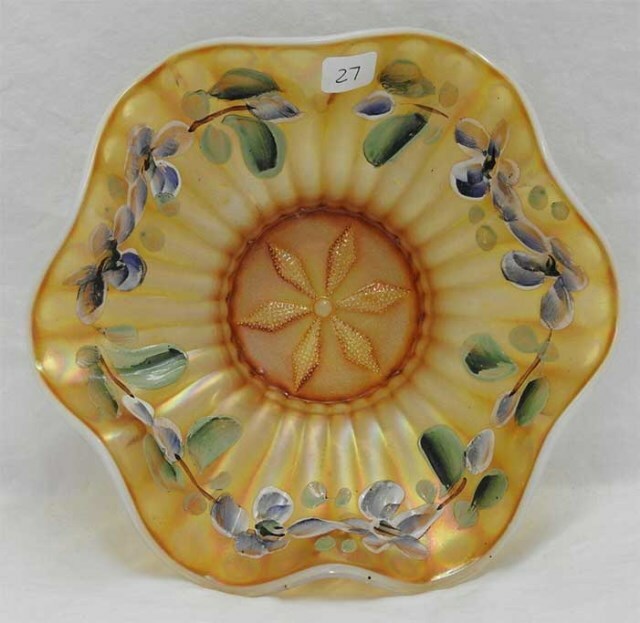 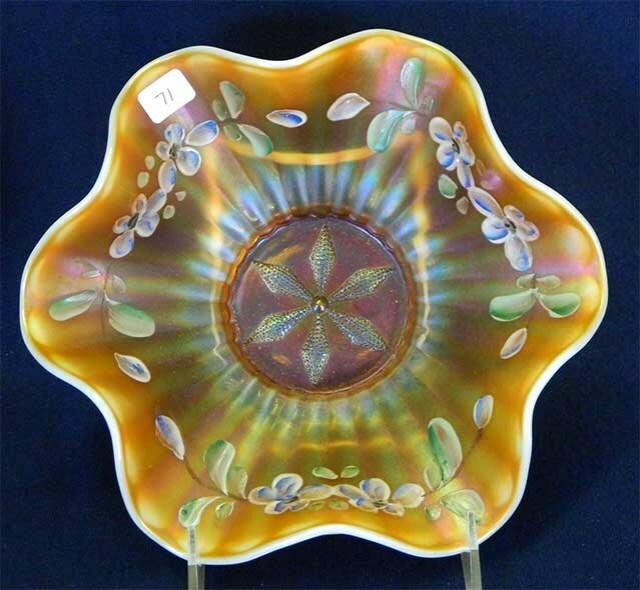 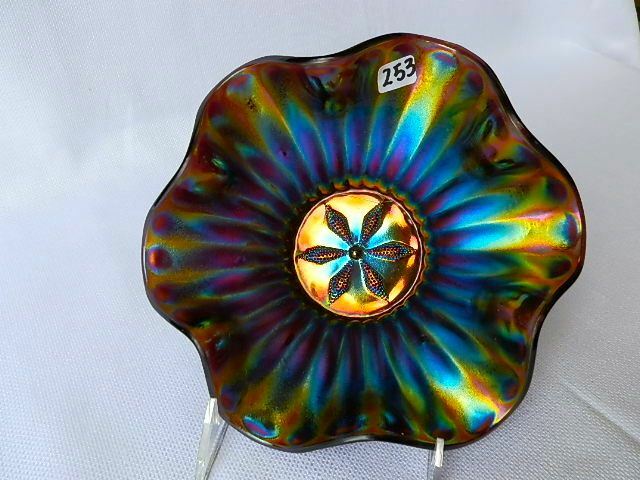 In 2009, peach opal bowls with enameled decoration sold for $55 and $110; in 2010 one brought $73.